This is the state of mind you should always have when you read an email. When something is too good to be true, it usually isn’t true. Here is an email I got, which sounds… well… too good to be true. 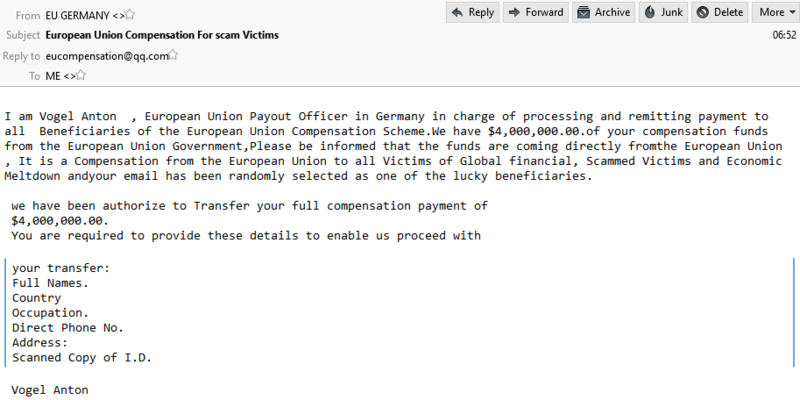 If you look at the key words: compensation, scheme, “European Union Government” (there is no such thing), email, randomly selected, lucky. I am Vogel Anton  , European Union Payout Officer in Germany in charge of processing and remitting payment to  all  Beneficiaries of the European Union Compensation Scheme.We have $4,000,000.00.of your compensation funds from the European Union Government,Please be informed that the funds are coming directly fromthe European Union , It is a Compensation from the European Union to all Victims of Global financial, Scammed Victims and Economic Meltdown andyour email has been randomly selected as one of the lucky beneficiaries. They require your full details to be able to use your credentials. At this point it is clear a scam. Whenever you see something that doesn’t look right (from both common sense as well as technical) then it is most probably not!